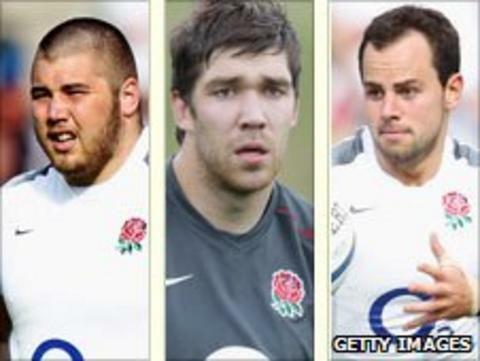 Leicester have confirmed the signings of prop Kieran Brookes, lock Graham Kitchener and scrum-half Micky Young. The young trio are all currently serving with the England Saxons squad in the Churchill Cup. Brookes, 20, and Young, 22, both move to Welford Road from Newcastle Falcons while the 21-year-old Kitchener joins from Worcester. "We're delighted to add such promising young talent to our squad," Tigers head coach Richard Cockerill said. "We've brought a number of young players through to our first-team squad in the last couple of seasons and we think these three have the potential to develop well within our environment. "We hope they all enjoy a successful Churchill Cup this summer and we look forward to them joining us in time for the build-up to the new season." Brookes made almost 40 first-team appearances for the Falcons last term while team-mate Young, who made his debut in 2007/8, has played 79 times for Newcastle in total. Kitchener, who has previous Premiership experience with Worcester, played 32 times for the Warriors last season as he helped them gain promotion back to the top flight from the Championship.